Cut flowers are pleasant in the home. Bright colors, crisp petals and fragrant blooms are cut and used for home decor, gifts, arrangements and centerpieces. Cut flowers are harvested from the mother plant and the source of hydration and nutrition that fed growth is removed. To identify cut flowers the gardener, look for several features and functions that set them apart from flowering plants. Flowers that work well for fresh cut bouquets have a stem sturdy enough to keep hydrating water flowing to the flower head. 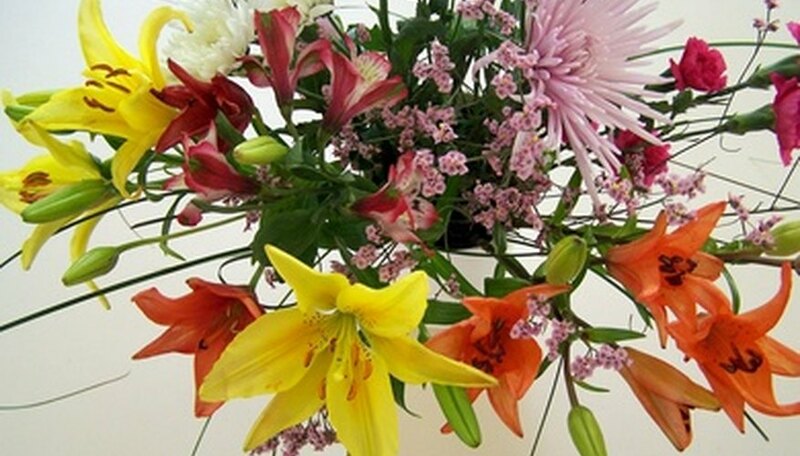 Each flower has a single or multiple blossom stalk that is used for floral arranging. Gladiolus, orchid, stock and snapdragons are multiblossom flower stalks that are used for many kinds of flower arranging projects. The carnation, rose, mum, iris and gerbera daisy are a few of the single cut flowers found in the garden or retail market. Blossoms can be removed from the stems of the cut flower stalk to be wired into wedding, funeral and styled centerpieces. Excess greenery, stalk and thorns are removed from the cut flower stem. Cut flowers such as sweet peas may have light and airy petals. Multipetal flowers including zinnia, daisy and dianthus add colorful mass to a floral piece. Unusual flowers such as amaranthus, statice and German statice add texture and color to a floral arrangement. Blooms on heavy or woody stems include peonies, cabbage roses and hydrangea blossoms are large cut flowers. Cut flowers are harvested when the stems are filled with nutrient-rich moisture. Flowers are gathered from greenhouses, garden plantings or wild plants such as the Queen Anne's lace. The stems are immediately immersed in water to fully hydrate before being shipped or stored in a cool place for later use. Cut flowers are enjoyed in vases of water, set flower arrangements or centerpieces. Cut flowers are featured in set pieces, arrangements, bouquets and displays at weddings, parties and funerals. Flowers that have unpleasant scents, sticky parts or delicate stems are better used for garden plantings and flower borders rather than cut flowers. Varieties of petunias, marigolds and spirea have a distinct odor or heavy scent that is unfriendly inside of the home. Cut flowers are colorful with scents that draw the viewer. Cut flowers need special care as the full source of nutrition has been removed from the stalk. In essence, the flower is dying. Water and commercial florist preservation powder may slow down the process for several days. Cut flowers will last longer in a cool environment. It is best to keep cut flower arrangements away from heat sources such as a sunny window, television top, working fireplace mantle and furnace vents. Why Do Carnations Last Longer Than Roses? Why Do Cut Roses Droop Their Heads? What Is the Life Span of Cut Flowers? Which Cut Flowers Last the Longest?